Welcome to the September issue of Weight Watchers magazine. This month, we’re getting back on track post-summer and discovering clever ways to make the programme even easier to follow on busy days. No matter what you have going on – or your budget – you can still eat well, get healthy and look great. Think you can’t follow the programme on busy days? We catch up with four members who used to think that way too, until they found ways to make it work. Now they’re feeling (and looking!) better than ever – in fact, they’ve lost a whopping 20st between them! And then there’s Ty, whose sudden health crisis was the push he and his wife Margaret needed to get healthy. Plus, member Sian-Elin shares how she swapped fast food for fakeaways to get fit for a dream holiday and we find out why Coach Rachel deserves a medal. If you’ve always thought healthy eating was beyond your budget, think again! Three of our favourite Insta-foodies (and members!) 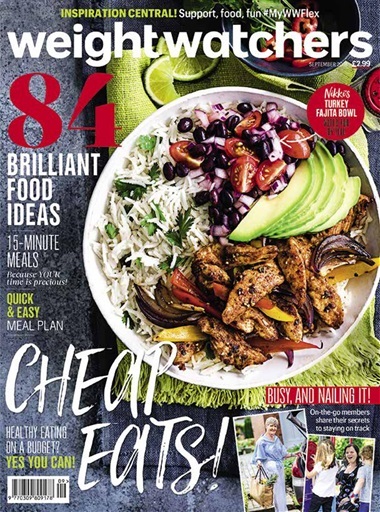 share their best money-saving meals – including our winning cover dish! Plus, the WW Kitchen team shares delicious ways with seasonal apples. We also showcase new ideas for using Weight Watchers Wraps, unmissable mince dinners and meals that are ready in 15 minutes, max. Feeling the pinch? With our 20 under £20 guide and save-or-splurge beauty, you can update your wardrobe (and make-up bag) for the new season without busting your budget. There’s also expert advice on how to boost motivation, easy ways to get fit for free, plus tips on resetting fitness goals, saving money on healthy food and sticking to a budget.